Home > Drive > Advice and guides > Car maintenance > What do I do if my car is overheating? What do I do if my car is overheating? The sight of steam pouring out from your overheating bonnet is not only distressing, it can also be bad news for the health of your vehicle. If your car’s overheating, it’s essential you know what to do to stay safe and avoid causing serious damage to your engine. To help keep you on the road, here’s our guide to everything you need to know if your car’s overheating. If your car breaks down but you don’t have breakdown cover, you can still call the RAC for breakdown assistance. Call our hotline on 0333 2000 999 and speak to one of our operators who will be able to set you up on any one of our annual breakdown cover policies immediately. Please note that for the first 24 hours of your policy you will be put on our Roadside Assistance Only policy. What should I do if my car’s overheating? How long will it take my car to cool down after overheating? How can I prevent my engine overheating? What damage will my car overheating cause? Is it safe to drive a car that’s overheating? Can you call out the RAC without breakdown cover? There are a number of different reasons your car might be overheating, and certain weather conditions can exacerbate the problem, such as a hot summer’s day where the temperature tops 30C. The most common causes of overheating are problems with a vehicle’s cooling system, like low coolant levels or an issue with the circulation. But it could also be a sign of a much more serious issue with your engine you’ll need to get looked at. If your temperature warning light has come on or there’s steam coming from your bonnet, pull over in a safe place as soon as possible, turn off your engine, and get all passengers away from the car and road. Open the bonnet from inside the cabin if possible, being aware that the steam may have made your bonnet incredibly hot and you may need to protect your hands. Leave the engine to sit for at least 30 minutes in order to cool down. Never remove the radiator cap or expansion tank cap of an overheated engine as it is pressurised and could lead to severe steam burns. If you do open the cap once the engine has cooled, open it slowly and cover your hand for protection. Once the engine has properly cooled, check the coolant tank near the radiator. If it’s empty it could mean you’ve run out or have a leak, so check under the car for signs of leakage like a puddle. If you need to top up the tank do so with coolant or warm water mixed with coolant. Avoid filling up with straight water if possible, and never pour cold water into a hot radiator as this could damage your engine. If the coolant is full, then the issue is likely to be something else mechanical with your engine — either a problem with the cooling system itself or something more serious — which will require professional attention. If you’re unsure of the problem or what to do, call one of our patrols who will be able to attend your car on the roadside and offer you friendly, knowledgeable advice about your engine. The RAC Approved Garage Network provides contacts for those garages that provide quality work and exceptional customer service, giving you peace of mind if your car does needs attention. If the temperature warning light on your dashboard — a small picture of a thermometer — comes on, that could mean your coolant levels are low and could be your first sign of an overheating engine. When it’s safe to do so, pull over and check your coolant levels, topping up if necessary. If the temperature gauge on your dashboard has moved into red let your engine cool down for at least 30 minutes before continuing. 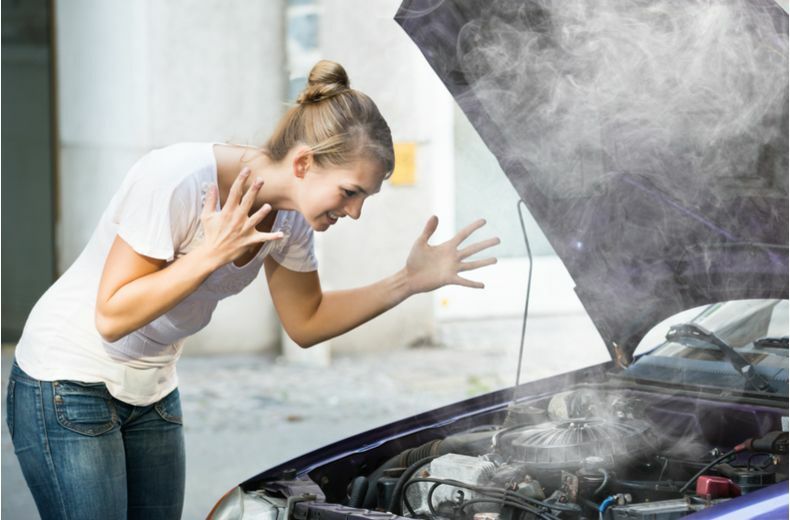 If the light comes on again, this could be symptomatic of an issue with your cooling system, so check your car into a garage and get it seen to as soon as possible. If your car’s overheating, pull over, switch off the engine and wait for at least 30 minutes for the engine to cool down. To be on the safe side, it’s preferable to wait an hour or two to fully let your engine cool. If you’re worried about your car overheating, ensure you have breakdown cover to meet your needs should you be out on the road and the worst happen. Keep your car cool in the summer by parking in the shade and using sun screens to keep your interior cool. Keep an eye on your temperature gauge and coolant levels, adding coolant whenever necessary to a cool engine, and letting your car cool down if needed. Carry extra coolant in your car so you’re able to fill up your fluid levels as and when needed. Get the air flowing by opening windows and floor vents to let warm air escape the cabin and help keep your car’s temperature down. Check your car in with a mechanic to have your cooling system flushed out and cleaned. Mechanics recommend having this done every 40,000 miles. 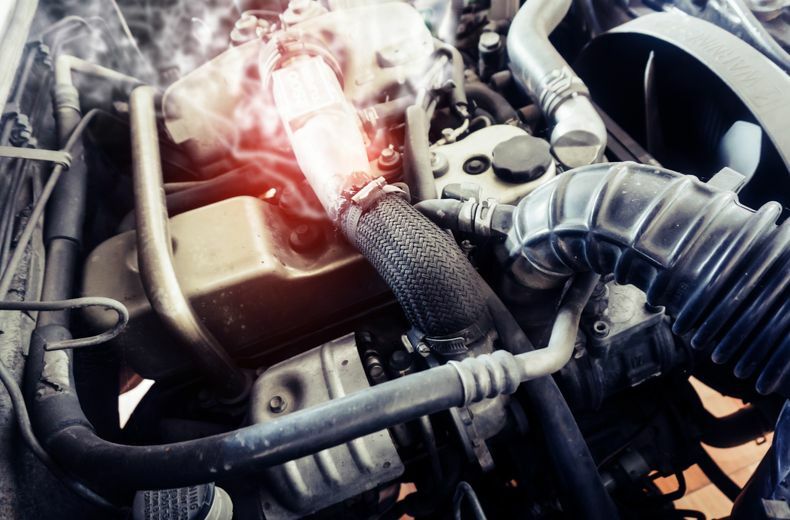 An overheating engine shouldn’t cause any lasting damage to your vehicle if you address the problem quickly and safely and seek professional help if the problem with your engine requires it. However, if you don’t address the issue — by failing to fill up your coolant or fix your cooling system — or choose to continue driving with an overheating car you could end up damaging it and leaving yourself with a hefty repair bill. If your car engine is overheating then the best thing you can do is to safely pull over and either wait for help to arrive, or for your engine to cool down if you’re confident of being able to fix the issue yourself. Never continue driving an overheated car as this could cause lasting damage to your engine and could see you paying out more for repairs in the long-run. Should you use your air-con in the winter?